Tired of endless Barking? The constant barking without reason could be a nuisance that drives you crazy. Now we have a great device for you. 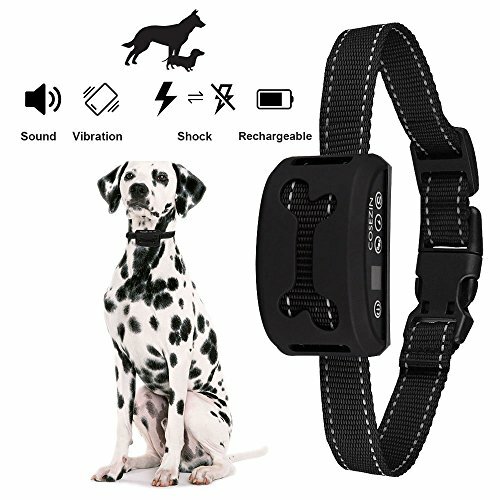 This Bark Collar will correct causeless bark automatically. Just put the anti bark collar on your dog and let the collar do the rest! - Please adjust the collar to a apposite size, it is necessary the prongs touch dogs' skin lightly. - Do put it on your dog over 12 hours per day. - The no bark collars are training aids, not punishment tool. - If your dogs keeping barking, you need to check it out. - Please charge the product with an adapter that shouldn't exceeds 1A. If you ever have any quality issue with your training collar, please feel free to contact us. ✅ FOR DOGS WEIGHING 7-120LBS: This anti bark collar is adjustable to fit in most breeds of dogs. Only dog wearing the collar can trigger the collar. Get your peace of mind back without hurting your pup. "HUMANE AND SAFE"
If you have any questions about this product by COSEZIN, contact us by completing and submitting the form below. If you are looking for a specif part number, please include it with your message.